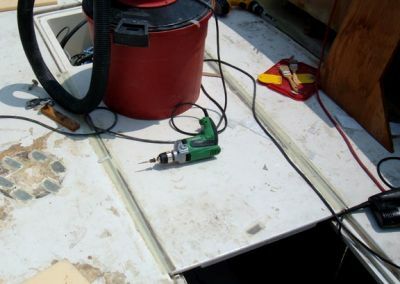 Fabricating the new deck and hatches for the new space created from the extension of the boat. The new deck will be foam cored. Lines conforming to the current deck, minus the thickness of the core, were drawn on the new part. Tabs were then screwed and glued in place that will hold the deck. 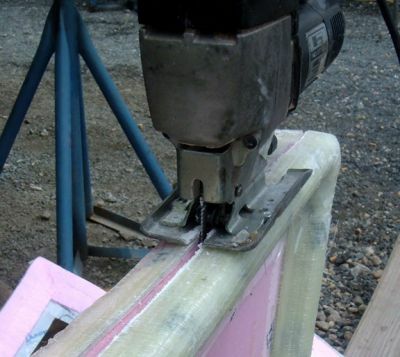 The part was cut allowing for bonding to the hatch opening and about 1/4" clearance to the hatch. 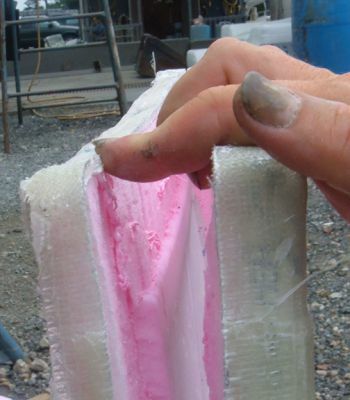 The part was then removed from the foam. Here is the part ready to be installed. 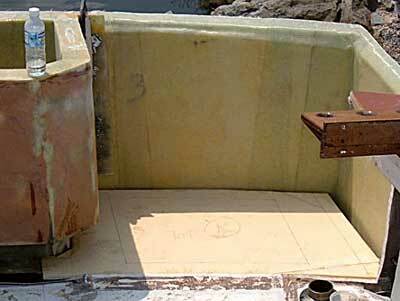 Because of the boat extension, the fighting chair plate will need to be moved aft, on the existing center hatch. 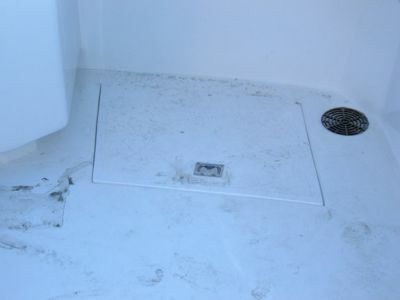 For this reason we chose to glass in this hatch and reinforce it for the deck plate. 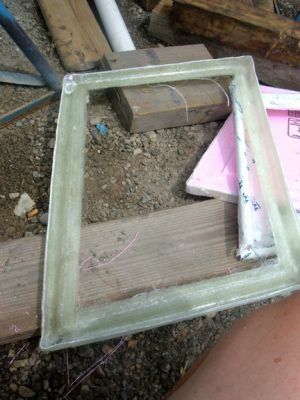 The existing deck plate was removed and the holes were glassed over. Dave is getting his dremmel tool ready to cut out the area for hatch pulls. 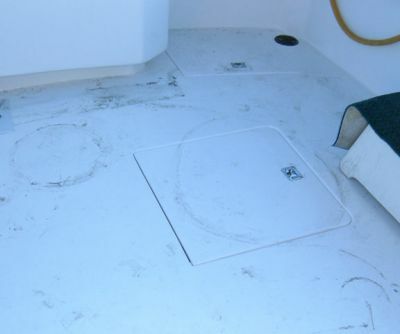 With the original center hatch eliminated, the newly installed hatch and deck have all been painted with non-skid paint. It's very dirty in this picture because water is not available on the pier during the winter. 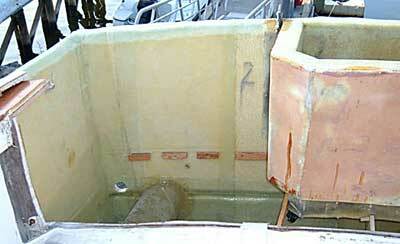 We are going to install hinges on the remaining original hatches and the new aft hatches will just sit in place. 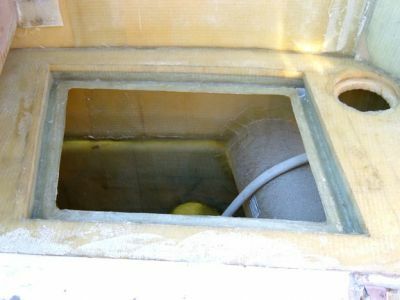 Here is the newly installed hatch with new handles. We put the same handles on the original hatches as well. 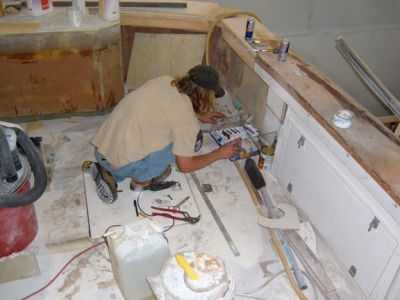 We need to install a gasket on the inside so water does not over-run into the bilge.